Ever wondered what it takes to unearth long lost artworks? What kind of detective work is required to retrace treasured antiques and objets d’art scattered two hundred years ago? 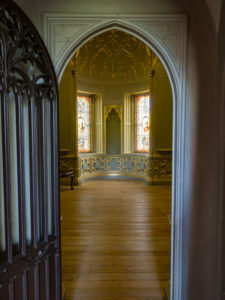 This is the fate that befell the celebrated collection of antiquarian and man of letters, Horace Walpole, once displayed in his home, Strawberry Hill House. 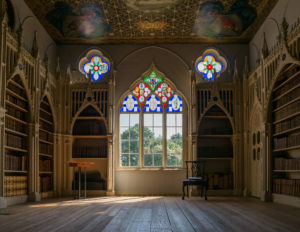 Centuries on, this series first will follow art historian and provenance researcher, Silvia Davoli, in her hunt for the lost treasures of Strawberry Hill and her bid to restore Walpole’s collections to his legendary gothic rooms. A party of visitors arrives at the north gate in the embattled wall encircling the gothic revival villa, which looms gleaming white and mysterious before them. Passing through the front door emblazoned with the mythical shield of Horace Walpole’s arms they enter a gloomy hall and climb the stone staircase illuminated by a tin japanned lantern. The party reaches the Gallery, hung with crimson damask and with seventeen feet high ceilings arching above their heads in a lacy canopy of gold mouldings. Walpole invites them to feast their eyes on the noble basalt bust of Vespasian. Originally in the collection of Cardinal Ottoboni and arranged on the right hand side of the Gallery’s chimney-piece, it is a jewel in the crown of Walpole’s fabled collection. 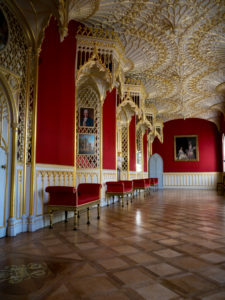 Centuries later, Strawberry Hill House, once a temple of the arts, harbours few traces of this once glorious collection. Architecturally masterful and beautifully ornamented the villa is now largely an empty shell. It is void of the precious and curious objects that once attracted regular visitors eager to wallow in the atmosphere of ‘gloomth’ created by Walpole, which inspired him to write his first gothic novel, ‘The Castle of Otranto’. I contemplate the empty space beside the chimney where Vespasian’s bust was once displayed. As the research curator of Strawberry Hill House I have pored over photographs of this bust and countless other spectacular objects long since gone from Strawberry Hill but immortalised in the archives. Separated only by time, Walpole and I are bound by our dedication to this temple. Walpole to building and documenting Strawberry Hill and its collections and I to my quest to track down Walpole’s missing treasures and reinstate as many of them as possible to their former home. The home which Walpole ironically referred to as a ‘small capricious house’ was built from a couple of cottages nestled on the banks of the Thames in the fashionable suburb of Twickenham. Inspired by a romantic vision to create a make-believe ancestral castle, Walpole transformed the site with the addition of pinnacles, battlements and a round tower. Inside, the self-proclaimed ‘English antiquary’ amassed a collection of over 4000 objects: Old Master drawings, paintings by Raphael and Reynolds, antique Roman sculptures, precious Renaissance Majolica, de Lamerie silver, Boulle furniture, Sèvres porcelain, miniatures, arms and armour. But even the ‘Master of Otranto’ was all too aware of the fleeting nature of his creation. With little faith in either the survival of his house or his collection and with ‘a view to their future dispersion’ he completed a detailed record of both: ‘A Description of the Villa of Mr. Horace Walpole… With An Inventory of The Furniture, Pictures, Curiosities’ printed first in 1774 and then again in 1784 on Walpole’s very own printing press housed at Strawberry Hill. Though he feared it would ‘look… a little like arrogance in a private man to give a printed description of his villa and collection’ Walpole’s foresight was remarkable. His predictions proved accurate and in 1842, his collection was dispersed throughout the world in a Great Sale held by the Waldegrave family. 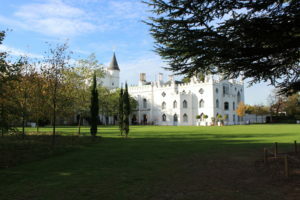 The Waldegraves inherited Strawberry Hill from Walpole’s cousin, the sculptress Anne Seymour Damer, and the 1842 sale was prompted by the financial ruin of the 7th Earl Waldegrave. Following the sale, Walpole’s gothic masterpiece became an increasingly isolated object of curiosity as his collection of the finest specimens of Gothic architecture and decorative objects disappeared in an artistic diaspora? Did Walpole genuinely anticipate that his inventory would one day be used to reunite his ‘assemblage of curious trifles’ in the gothic reliquary that was his home? What would such an epic treasure hunt entail? I have gone to extraordinary lengths to find out. Over three years, I have successfully retraced over 150 objects from Walpole’s collection. My research tools are multifarious and my investigation has led me around the world. From Walpole’s correspondence, inventory and drawings of his house and collection commissioned from John Carter to the 1842 Great Sale catalogue. From records held at the Lewis Walpole Library at Yale University to Google. It was a Google search of an inscription on a Renaissance bas relief once held in Walpole’s collection, which led me to unearth it in the collection of Amsterdam’s Rijksmuseum. A portrait of Eleonor of Aragon (1450-1493) by Sperandio of Mantua from ca. 1475, Walpole erroneously believed the relief depicted Eleonora d’Este (1537-1581). Googling ‘Dia Helionora’ led me to a photo of the very same relief in a blog posted by a visitor to New York’s Metropolitan Museum of Art. The relief had been lent to the Met by the Rijksmuseum for an exhibition of Renaissance portraiture but was unrecognised as Walpole’s. Hundreds more of the lost treasures of Strawberry Hill remain at large. To what dusty archive, museum store, stately home or even blog post will my search take me next? Could you be the one to provide me with the clues to find every last lost treasure of Strawberry House? The search for the remaining treasures starts here. First, we go on the hunt for a bejewelled Turkish dagger bought from Walpole’s collection by actor Charles Kean and with possible ties to King Henry VIII. Strawberry Hill House, 2017, © Bethan Wood. Horace Walpole by John Giles Eccardt, 1754, © National Portrait Gallery, London. 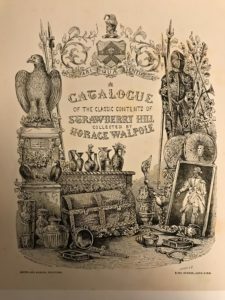 A Catalogue of the Classic Contents of Strawberry Hill Collected by Horace Walpole (London: Smith and Robins, 1842) courtesy of the Lewis Walpole Library, Yale University.